John Atkinson and Whiterose Queen were the victors of the Harden Moss double gather championship, the conclusion to three days of trialling. This annual charitable event which is held on elevated ground above Holmfirth, will this year donate any surplus proceeds to the Yorkshire Air Ambulance. Although the weather was mixed the trials were well supported and the gate was slightly up on the previous year. Alec Baines, who won the championship last year with Tanhill Lassie, judged all classes. Running was over a flat course which most gathered left-handed as the dogs could run too wide on the right. Worked in packets of five in the two qualifying trials the Texel cross shearlings were flighty. They would often set off at speed when turned into the lengthy cross-drive and after running in a straight line would veer off-line as they approached the last obstacle, which was missed by many. They would not easily pen but opened up reasonably well for the shed where ideally the last two sheep had to be taken. From Friday’s entry of 39 Thomas Longton and Maya (B. Helliwell’s Nel, S. Temple’s Cap) ran fifth. After losing just two points from her out-bye work, Maya lost five points throughout her driving. She put her sheep cleanly through the Maltese cross before six points went at the pen. Finishing with a clean shed gave Maya the winning score of 97. Running at 15, her kennel mate Jim was the runner up on 96 points, a score matched by Shirley Cropper and Danny who were placed third on an out-bye decision. On Saturday 61 dogs ran. Because of the larger entry it was decided the Maltese cross would be dropped. Ian Murdoch ran Ben at number 20. Gathering right-handed Ben started to come in and was given two extra commands which cost him four points. He dropped six marks from his drive and losing one point at the pen put him on 89. Running at 42, Anni Ritakallio and Come-bye Jazz (J. Goulder’s Killiebrae Belle and Killiebrae Joss) had outstanding outfield work. After losing just one single point from their gather the remainder of their run was clean. However, they were timed out at the shed, therefore scoring 89 points they took the title with better out-bye work. On Sunday in the local open 14 dogs ran on the same course as Saturday. James Howard was standing top with Lad on 83 points until he went to the post with Bill (J. Howard’s Sue and Wisp). After losing three points over the outfield Bill had a clean pen, but he was also timed out at the shed. Nevertheless, scoring 87 Bill took a clear five-point lead. From the two qualifying trials the top three went forward into the championship along with the winner of the local open. John Atkinson and Whiterose Queen were drawn to run third. Queen ran out to the right, going through the trees to pick up her first packet of three sheep without fault. She had a clean lift and clean fetch. When it came to her blow back the second packet of sheep had not been let out, therefore, John was given a re-run. Thomas Longton ran fourth with Maya who, losing just one from her first gather, had excellent out-bye work. She dropped 10 marks from her driving. Although in the championship the sheep ran well over the outfield they remained tricky at both the Maltese cross and the pen, where Maya dropped two and five points respectively. She finished with a clean shed to take the lead on 132. John and Queen followed Thomas and were marked from their blow back where Queen needed a couple of extra commands for which she lost four points. Otherwise her second outrun, lift and fetch were not faulted. She slipped two sheep at the first drive obstacle before catching the cross-drive hurdle well and had a good turn into the return. Six points were deducted from her driving. Queen’s sheep walked straight through the Maltese cross. As she held her packet in the mouth of the pen one sheep broke. She brought her back and put the six in at a loss of two points. To finish she shed off the last two sheep without fault and with 138 points Queen was the clear winner. 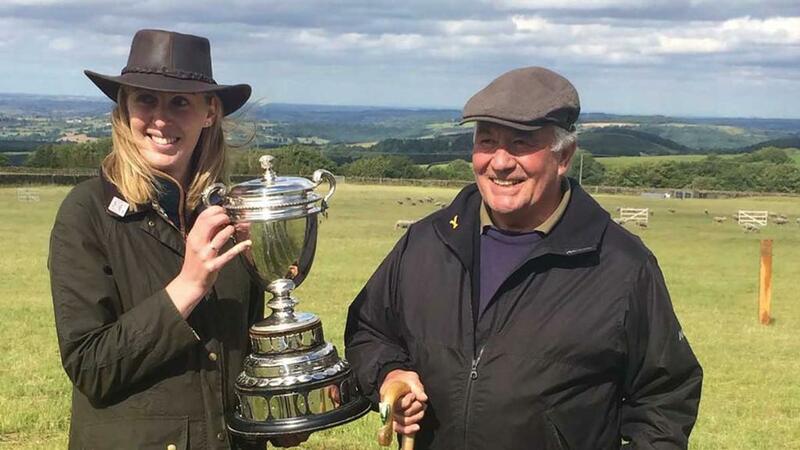 Rebecca Stafford, the granddaughter of Bert Wake who was a founder member of the Harden Moss Sheepdog Trials and who was secretary for more than 50 years, presented John with the trophy. Rebecca is an agricultural valuer at Wm Sykes and Sons of Holmfirth, who were sponsors of the trial. HARDEN MOSS, Greenfield Road, Holmfirth, West Yorkshire (Judge, A. Baines, South Stainmore) Friday open (39 ran) 1, Thomas Longton (Quernmore) Maya, 97 of 110; 2, Thomas Longton, Jim, 96 OLFD; 3, S. Cropper (Deerplay) Danny, 96; 4, I. Ibbotson (Oakworth) Jim, 94 OLF; 5, R. Watson (Millom) Ricky, 94; 6, K. Cropper (Shap) Zac, 85. Saturday open (61 ran) 1, A. Ritakallio (Burton) Come-bye Jazz, 89 of 100 OLF; 2, I. Murdoch (Sutton-on-the-Forest) Ben, 89; 3, J. Atkinson (Escrick) Whiterose Queen, 87 OLF; 4, C. Pickford (Rainow) Rainow Liz, 87; 5, S. Wilkinson (Thurgoland) Jess, 86 OLF; 6, P. Exelby (Nun Appleton) Perrydale Gwen, 86. Local open (14 ran) 1, J. Howard (Holme) Bill, 87 of 100; 2, J. Howard, Lad, 83; 3, J. Wood (Norland) Taff, 73; 4, J. Mellor (Hayfield) Lucky, 73. Nursery (17 ran) 1, J. Richardson (Strinesdale) Ceri, 75 of 90; 2, A. Wilkinson (Thurgoland) Grace, 75; 3, L. Broster (Outlane) Lace, 60; 4, J. Wood, Jim, 60. Young handlers (5 ran) 1, K. Cowburn (Rainow) Meg, 46 of 70; 2, R. Hetherington (Batley) Saph, 43; 3, T. Gregory (Peak Forest) Meg, 40. Brace (10 ran) 1, C. Pickford, Rainow Liz and Rainow Meg, 123 of 140; 2, S. Cropper, Danny and Beechwood Ben, 109; 3, Thomas Longton, Maya and Fan, 100; 4, A. Ritakallio, Come-bye Jazz and Kipi, 87. Double gather championship (7 ran) 1, J. Atkinson, Whiterose Queen, 138 of 150; 2, Thomas Longton, Maya, 132; 3, J. Howard, Bill, 130 OLF; 4, Thomas Longton, Jim, 130; 5, I. Murdoch, Ben, 129; 6, S. Cropper, Danny, 121. Sponsored by W.M. Sykes and Sons, Holmfirth. BLEASDALE Charity trial, Cobble Hey Farm, Claughton Brock, Lancashire (S. Perello, Caton) Open (51 ran) 1, Thomas Longton, Maya, 75 of 100 OLF; 2, R. Briggs (Wennington) Nell, 75; 3, T. Huddleston (Caton) Udale Ola, 72; 4, J. Palmer (Twiston) Gill, 67; 5, S. Cropper, Danny, 64 OLF; 6, J. Palmer, Dot, 64. DEVON AND EXMOOR, Ralegh’s Cross, Exmoor (C. Roe, Cadeleigh) Open driving (34 ran) 1, A. Blackmore (Ledbury) Nip, 80 of 100; 2, Ray Edwards (Chulmleigh) Bob, 72; 3, J. Harper (Jacobstowe) Parksfarm Moe, 71; 4, C. Worgan (Chulmleigh) Holly, 70 OLF; 5, R. Slattery (Tivington) Lash, 70; 6, B. Watson (North Tawton) Jay, 69. Best novice, A. Blackmore, Nip, 80 of 100. Best OLF, Ray Edwards, Bob. Maltese cross (R. Hayes, Witheridge) (13 ran) 1, J. Watson (Postbridge) Gwydr Zac, 80 of 90; 2, J. Watson, Jim, 66; 3, C. Worgan, Lee, 64. Best novice, J. Holdsworth (Moretonhampstead) Loki, 53. NORTHUMBERLAND League, Whitfield (V. Smith, Brampton) Open (59 ran) 1, E. Gray (Ewesley) Tweeddale Jamie, 96 of 100; 2, R. Fawcett (Hardraw) Lola, 95; 3, J. Relph (Greystoke) Bill, 94; 4, L. Cowper (Threlkeld) Spot, 93 OLF; 5, B. Jordan (Whitfield) Shasta, 93; 6, R. Watson, Nidderdale Nidd, 92. Best novice, P. Howe (Hawick) Mirk, 85. NORTHUMBERLAND League, Debdon Farm, Rothbury (A. Wallace, Bellingham) Open (37 ran) 1, K. Preston (Elsdon) Roy, 95 of 100; 2, K. Cropper, Tsavo, 91; 3, B. Jordan, Bozo, 89; 4, E. Gray, Tweeddale Jamie, 88; 5, C. Balmbro (Wooler) Scott, 85; 6, D. Baxter (Harbottle) Laddie, 84. SUSSEX, Glynde (A. Jackman, Brockham) Open (29 ran) 1, M. Fox (Dorchester) Reg, 96 of 110; 2, M. Banham (Chipstead) Rob, 95; 3, R. Moore (Ditchling) Cap, 92; 4, E. Anstey (Haselmere) Tweed, 86 OLF; 5, John Marsh (Golden Cross) Hutch, 86; 6, M. Fox, Alf, 82. Best novice, John Marsh, Clait Flare, 65 of 110. MID-SHIRES, Framlands Farm, Melton Mowbray (B. Smith, Wytham) Open (31 ran) 1, C. Neal (Wormegay) Blake, 91 of 100; 2, P. Johnson (Burton upon Trent) Jack, 89 OLF; 3, N. Vyas (John O’Gaunt) Mist, 89; 4, A. Tomkinson (Melton Mowbray) Gwen, 86; 5, R. Smith (Chipping Norton) Bob, 85; 6, B. Powell (Cold Ashby) Mirk, 84. Novice, 1, J. Porter (Broughton Astley) Jo, 82 of 100; 2, A. Warmington (Gaydon) Rooten Brook Moss, 64. CORNWALL, Trethern, Delabole (T. Hopper, Veryan) Open driving (33 ran) 1, R. Watson, Jay, 88 of 100; 2, J. Nicholls (Buckland Brewer) Rob, 83 OLF; 3, J. Watson, Huthwaite Roy, 83; 4, Ray Edwards, Bob, 82 OLF; 5, I. Mackay (Lustleigh) Sanduck Mai, 82; 6, J. Watson, Joe, 80. Open maltese cross (J. Summers, Tintagel) (5 ran) 1, J. Watson, Zac, 76 of 90; 2, J. Nicholls, Joe, 73; 3, Ray Edwards, Jet, 71; 4, T. Hopper, Zac, 57. Novice maltese cross (7 ran) 1, J. Watson, Spot, 75 of 90; 2, J. Carter (Delabole) Joe, 72; 3, Ray Edwards, Clyde, 71; 4, J. Watson, Jack, 62. New handlers (2 ran) 1, L. Ireland, Ned. Young handlers (3 ran) 1, W. Carter (Davidstow) Joe. July 1. NORTHUMBERLAND League, Pink Ribbon Open, Mains Rigg Farm, Whitfield, NE47 8HR, 8am start, enter on field, catering. DEVON AND EXMOOR, Open driving with best novice and best young handler, Brendon Hills, Exmoor, 8.30am start, entry closed, catering. July 1 and 2. OSBERTON, Opens, Osberton Estate, Worksop, Nottinghamshire, S81 0UE, 8am start, entry closed. July 2. PINK RIBBON Trial, new handler and novice, Mains Rigg Farm, Whitfield, NE47 8HR, 8am start, enter on field, catering. KENTISBURY DOWN, Open driving, signed from Blackmoor Gate, Kentisbury Down, Devon, 9am start, entry closed. ROMNEY MARSH, Kent championship, Dean Court, Westwell, TN25 4NH, entry closed. MALTON SHOW, Open, Scampston Park, Malton, North Yorkshire, 9am start, enter on field. July 9. BROOMHEAD SHOW, Bolsterstone, Sheffield, S36 4ZA, pre-entry first 50 dogs to S. Wilkinson, tel 07762 182 010 or 01142 883 575. CLEAN work outbye and at-hand put Ian Wilkie’s Floss ahead on a day of unseasonal weather at Lairg. A very strong, gusty wind played havoc with the dogs’ hearing on a showery day, and a number were disturbed by the sound of wind under the electric lines which cross the field at the top of the fetch, which spoiled some runs. The recently clipped Cheviot gimmers ran well on the flat course, if dogs kept their distance from them, and although they were challenging at the pen, steady dogs and patient handlers penned. Floss ran out and lifted flawlessly, had a little trouble keeping the sheep on-line on the fetch and to a lesser extent, on the drive, but got her gates and finished the winning run with a clean pen and shed. John MacDiarmid’s Moss was a little short on his outrun, but he lifted cleanly. Again, the main flaw in the work was a degree of difficulty keeping the sheep on-line on the fetch and drive, but he too, hit all his gates. A clean finish completed the run in second place. Neat turns gave Alistair Stewart’s Tweed the edge over Stuart Davidson’s Gillieglen Queen at Airtnoch. The North Country Cheviot gimmers were light to handle on a rolling, slightly downhill course and some dogs were drawn in by the terrain, on their outrun. The gimmers were released on a ridge and dogs were out of sight of the handler when they were behind the sheep. Tweed ran out very slightly short, but the gimmers came square on and straight up the fetch. The drive was good, with tight turns, and Tweed worked hard to pen the sheep without any breaks. A good, quick shed completed the winning run. Stuart Davidson’s Gillieglen Queen ran out well, but the gimmers had moved off, making the lift untidy in appearance. A good fetch followed and the drive went very well, until the sheep made a slightly wide turn out of the cross-drive gate. Good close work finished Queen’s run in second place, a single point behind Tweed’s. AIRTNOCH (Judge, I. Fleming, Douglas) Open (80 ran) 1, A. Stewart (Lockerbie) Tweed, 95; 2, S.L. Davidson (Sandbank) Gillieglen Queen, 94; 3, T. Blacklock (Kirkconnell) Ben, 90; 4, J. Hastie (Saline) Lethans Bear, 89; 5, J.J. Templeton (Fenwick) Harris, 87; 6, S.L. Davidson (Sandbank) Hope, 85. LAIRG (S. Grant, Strathcannaird) Open (45 ran) 1, I. Wilkie (Keithhall) Floss, 90; 2, J. MacDiarmid (Eynort) Moss, 87; 3, J. Lamont (Portree) Craig, 79; 4, P. Martin (Glenlyon) Jill, 75; 5, P. Martin (Glenlyon) Jen, 73; 6, J. McKillop (Fort Augustus) Joe, 71 Outbye; Sutherland, I. Sutherland (Strathnaver) Jimmy, 66. LLANARMON DYFFRYN CEIRIOG DOUBLE FETCH FINAL (Judge, Emrys Lewis) 1, K. Evans (Libanus) Preseli Ci, 28 OLF; 2, K. Evans, Ace, 28; 3, R. Hutchinson (Lancashire) Jock, 34; 4, A. Jones (Selatyn) Jane, 37; 5, S. Holt (Libanus) Hybeck Blake, 40; 6, D. Davies (Abergynolwyn) Sali, 43; 7, C. Roberts (Oswestry) Roy, 47; 8, A. Driscoll (Llanllawddog) Mazi, 54. LLANRHAEADR (Arthur Roberts) Open national, 1, E. Lewis (Abergele) Denwyn Ruby, 8; 2, T.E. Jones (Barmouth) Omega Jazz, 10; 3, H. Francis (Llanfyllin) Denwyn Mist, 13; =4, P. Williams (Treuddyn) Meg 15; =4, M. Evans (Llanfachreth) Meg, 15; 6, A. Owen (Corwen) Llangwm Glesni, 16. Class 2, 1, P. Williams, Meg; 2, J. Hill (Bala) Nel; 3, B. Williams (Ysgeifiog) Elwy Lad; 4, T.E. Jones (Barmouth) Fly. ABERSOCH AND LLANHENGAN (J.R. Jones) Open national, 1, D. Davies (Llaneryn) Sali, 5; 2, A. Driscoll (llanllawddog) Kinloch Pippi, 6 OLF; 3, A. Owen (Penygroes) Glenys, 6; 4, J.E. Lightfoot (Llandegla) Cao, 7; 5, G. Lightfoot (Llandegla) Omega Taff, 9 OLF; 6, Ll. Evans (Swyddffynnon) Zac, 9. Class 2, 1, J.R. Griffith, Taff, 15; 2, P. Williams (Treuddyn) Bob 20 OLF; 3, T.E. Jones (Talybont) Fly, 20; 4, P. Williams, Meg, 23. Young handler, E. Smith (Llanaber) Jaff. SARN A’R CYLCH (Medwyn Evans) Open national, 1, A. Owen (Corwen) Llangwm Cap, 7; 2, G. Owen (Pengraigwen) Ben, 10; 3, G. Owen, Moss, 11 OLF; 4, J. Jarman (Llangwyfron) Roy, 11; 5, A. Owen, Roy, 12; 6, E.L. Morgan (Aberystwyth) Craig, 14. Class 2, 1, E. Roberts (Ysbyty Ifan) Erin, 16; 2, J.R. Griffith (Talysarn) Jet, 19. Class 3, 1, E. Roberts, Erin, 16; 2, K. Dyszy, Meg, 21; 3, D. Edwards (Penrhyndeudraeth) Jet, 32. July 1. LLANLLYFNI Glynllifon Field, Glynllifon College, open national and Class 2, enter on field, catering, contact G. Pierce Roberts, tel: 01286 882 179/ 07879 844 038. POWICK Pixham, Callow End, Worcester, WR2 4TH, open and novice national, two sessions, catering, enter on field, start 7:30am, contact A. Potter, tel: 07904 360 323. July 2. FFOS Y FRAN Llanllawddog, Carmarthen, SA32 7JG, open national and young handler class, pre-entry, start 8:30am, contact A. Driscoll, tel: 07786 794 406. July 7. LLANRWST Nant y Wrach Fawr, LL26 0NR, local class, start 6:30pm. July 8. LLANRWST Open national and Class 2, enter on field, catering, start 8:30am, contact N. Williams, tel: 01492 640 859/ 07879 225 105. BETWS YN RHOS Coed Coch, Dolwen, LL22 8PA, open national and Class 2, enter on field, catering, start 7:30am, contact R. Owen, tel: 01492 680 204/ 07786 415 135.